What’s the Difference Between Refacing and Refinishing? 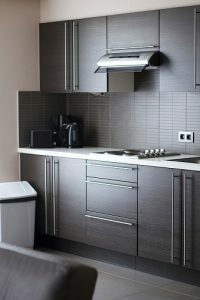 Is your kitchen in need of a makeover, but you don’t have the time or the budget to completely renovate your kitchen? No problem. In the world of kitchen cabinetry, you have two less expensive, less time-consuming, but just as appealing options—refacing and refinishing. But what is the difference between the two and which one makes more sense for your home? Let’s first discuss what each entails. Kitchen cabinet refacing, a popular choice for homeowner’s today, entails the removal of existing drawer faces and doors and installation of new ones. With refacing, your existing cabinet boxes remain intact and veneer is added to them. This option is considered a close substitute to cabinet replacing, but does not have the hefty price tag nor does it involve a complete removal of old cabinets and replacement of new ones. With kitchen cabinet refinishing, there is no removal of any existing kitchen cabinetry. The process involves either sanding or chemically stripping the existing finish from the cabinets and refinishing them with new paint or stain. Cabinet refinishing only works on wood cabinets. Condition and Type of Existing Cabinets – If your cabinets are made of wood, either option can work for you. If your cabinets are made of laminate or thermofoil, refinishing is not an option due to the inability to sand or strip these materials, and paint will not stick to these surfaces. Kitchen refinishing is for those that like the style of their wood cabinets, but need a change of color. Refacing is an excellent choice for homeowners wanting the look of a full kitchen remodel without changing the layout. This is accomplished by replacing the existing doors and drawer faces and adding matching veneer to the existing cabinet boxes. Your cabinet boxes must be in good condition to move forward with refacing. Time – Cabinet refacing is a quick and simple process when hiring experienced professionals, such as Desirable Kitchens and Refacing. Most refacing projects are completed in 3-5 days or less. During this time, you are still able to utilize your kitchen. If you choose cabinet refinishing, the project will take approximately the same amount of time as refacing, but you may be required to leave your home due to the strong fumes of the varnish and lacquer. Budget – Cabinet refacing and cabinet resurfacing are both affordable options when compared to cabinet replacing. There are no new cabinet materials required with refinishing, so the cost is typically 60% of the cost of refacing. But if you are looking to make a quality change with little additional investment, then cabinet refacing will give you more bang for your buck. The project completion times and budgets mentioned above are based on hiring a company in Pittsburgh to reface or resurface your kitchen cabinets. If you are considering handling the project on your own, you will need to account for additional labor hours and costs for needed materials. From cabinet refacing to cabinet refinishing, the team at Desirable Kitchens & Refacing has the right solution for every customer – every time! The dedicated and experienced team works closely with you to find the most cost-effective and time-efficient way to upgrade your kitchen while adding value to your home. For a free consultation or more information, please call 412-515-0582.